1 Depending on the magnitude of gk, qk length AB and BC, yGkinf Sk (= 1.0 gk) may be more critical for span moment. 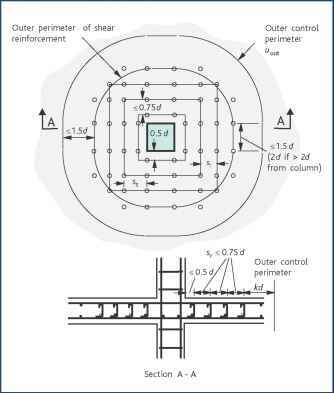 Quasi-permanent load combinations may also be used for calculations of crack widths or controlling cracking, i.e. the same load combinations as shown in Figures 2.19 and 2.20 may be used to determine SLS moment to determine stress in reinforcement. The characteristic and/or frequent combinations may be appropriate for other SLS limit states: for example, it is recommended that the frequent combination is used to determine whether a member has cracked or not. For the frame shown in Figure 2.21 identify the various load arrangements to check overall stability (EQU) against overturning. Assume that the structure is an office block and that the loads qk2 and qk3 may be treated as arising from one source. Accompanying variable action = Y~ l.y c t,05 Permanent action, unfavourable = - 1.1 <i,.